Amanda is the Co-Founder of RootedNY (@RootedNY), connecting consumers with their food by bringing them directly to its source. How? 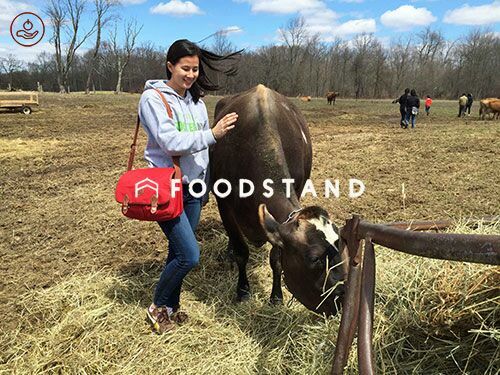 RootedNY provides behind-the-scenes tours of local farms and food makers in New York. Like many, Amanda grew up sourcing groceries from the store. But at the age of eight, her family paid a visit to a friend who had a chicken coop, and Amanda was asked to collect the eggs for breakfast. This experience had a lasting impact, and years later—in early 2015, she and her college roommate Clarissa Delap founded RootedNY, allowing those without farm contact to have their very own chicken coop experience! Tours of local farms and food producers. We want to bring people behind the scenes of food to make an authentic connection to the people and places making our food. I’ll borrow Carlo Petrini’s definition—good food needs both taste (to be delicious to us personally) and knowledge (to tell a cultural and historical story). What was your hardest moment in relation to your business? We had to cancel a tour due to low ticket sales, which was a bit heartbreaking, although we learned a lot from it. Asking people to commit to a full day or half day with us is always going to be a challenge. There have been so many over the years, starting with my mom and most recently other food educators like Karen Washington and Marion Nestle. The food and booze at every industry event is always delicious and interesting. My apartment is always full of esoteric food products that I need to find uses for. I’d probably still be in real estate finance—bored and unfulfilled. Ernest Hemingway at a small Ibérico ham producer in the Spanish countryside, and we would drink wine straight out of a leather bota bag. At least three types of cheese, butter, eggs, pickles, onions, garlic, and beer. For everyone to understand and appreciate the true value of food.